I have always believed in the power of the stories women tell about their lives. These are the stories that can soften landings, bolster new beginnings, and telescope dreams so that they appear within reach. These are also the types of stories that were shared by our grandmothers and passed down to our mothers, the stories that came from the heartbreaks and revelations of our great aunts and neighbors, the stories that soothed and inspired. While many women today lack this sort of community, it is my hope that together we can create it. This is the purpose of The Great Women Series. It is a compilation of the best advice from the most outstanding women I know. Some are authors and artists, like myself. Others are athletes, teachers, survivors, healers and shining spirits. Some are well-known. Others, more private. Some have touched my life profoundly. Others only briefly. Some I have known my whole life. Others, it only feels that way. All are women that I admire and whose words and stories I have found inspiring. I am proud to bring their voices and their uncommon wisdom to the world. My hope is that their words will awaken and empower girls and women on the journey to becoming who they are meant to be! Some stories of the journey are not for the faint of heart. Some are war stories. Others are stories of incredible grace and good fortune. Few are unmarked by heartbreak. Many, by tragedy. Most hold uncommon wisdom. Almost everyone has experienced a miracle of some sort. I have rarely met anyone who didn’t consider herself incredibly lucky in some area of her life. Several months ago, after finishing up my book tour for The Language of Trees, I started meeting with book groups. I was impressed and humbled by the candor and the wisdom of the women in these groups as they related to characters in my novel and began to tell me their own stories. In group after group, I’d look out at these resplendent women and feel an overwhelming sentiment: Gratitude. And the realization that all of us are so very wise at different times in our lives. Our unique journeys are our most precious gifts. Find us at – http://www.greatwomenseries.com . 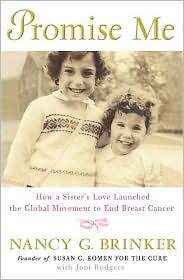 Pictured: Promise Me: How a Sister’s Love Launched the Global Movement to End Breast Cancer by Nancy G. Brinker and Joni Rodgers.